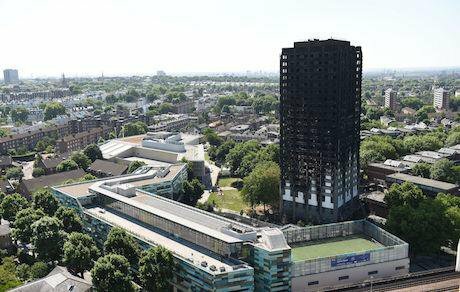 After Grenfell, it’s time for the government to urgently rethink its attitude to regulation. In 2016, the department for Business, Innovation & Skills boasted that the UK had the lowest burden of regulation in the G7. Photo: David Mirzoeff/Press Association. All rights reserved. Since 2011, consecutive governments introduced a “one in, one out”, then “one in, two out” and now “one in, three out” rule for any new regulations. Regulations costing businesses one, two and now three times as much must be removed before any new regulation imposing costs can be introduced. Regulations have been seen as bad for business, characterised as constricting and stifling “red tape” which requires removal. On 3 March 2016 a press release from the then department for Business, Innovation & Skills boasted that the UK already had the lowest burden of regulation in the G7. Now that Britain is leaving the European Union, many are demanding even more de-regulation. Leading Brexiteers and now key figures in the government, Michael Gove and Andrea Leadsom, have called for Brexit to be used as an opportunity to slash regulation. Now that Britain is leaving the European Union, many are demanding even more de-regulation. At the time of writing, flammable cladding has been found on every one of the 120 tower blocks so far tested, it is clear that we require more and / or better regulations in order to provide adequate protection, not less. Regulations are not introduced simply to obstruct and encumber businesses. They are there to protect people, property and our environment. Many important regulations have been created following disasters in order to prevent them from occurring again. It is vital that we have smart regulations which are proven to provide protection in the most effective way possible. It is important that we revisit and reconsider our existing regulations. But taking a blanket approach that it is better to have less regulation can lead to governments removing vital protection, and failing to introduce regulations that could make us all safer. Clearly this was the case in relation to fire safety. Concerns about flammable cladding were raised following a fire that quickly spread up Garnock Court tower block in Irvine, Scotland in 1999. After six people died and more than 20 were hurt in the 2009 blaze at Lakanal House in Camberwell, the inquest that followed highlighted the fact that cladding could make a fire spread more quickly. Since the Coroner’s Report into the Lakanal House fire in 2013, the All-Party Parliamentary Fire Safety & Rescue Group has repeatedly called for a review of safety regulation to prevent any future tragedies taking place. Despite the continuing risk of tower block fires, highlighted by the Shepherd’s Bush fire in 2016, the government failed to do so. Compounding the failure to create or maintain adequate regulations is the fact that they are often not properly enforced. In a debate in Parliament in 2014, the then Housing Minister Brandon Lewis rejected calls to force construction companies to fit sprinklers into any new homes, citing the need to reduce regulation and reduce obligations on housebuilders. Mr Lewis told MPs that whilst he accepted that sprinkler systems could provide protection from fires, the government considered that instead of regulating for their use, the onus was on the fire industry to increase installation by marketing sprinkler systems more effectively. It is simply unacceptable that, following years of warnings, it may take a disaster on the scale of the Grenfell Tower fire to make the government reconsider improving fire safety regulations. Compounding the failure to create or maintain adequate regulations is the fact that they are often not properly enforced. The independence and importance of inspections has been reduced and government cuts have left regulators and authorities with less funding to check for regulatory compliance. Teresa May has said that flammable cladding such as that found on Grenfell Tower was not compliant with building regulations. If this is proven then it is staggering that every one of the 120 towers which have so far been tested has featured flammable cladding. We cannot accept a situation where regulations vital to protect public safety are simply ignored. The fact that nobody had even identified this until the tragedy at Grenfell Tower shows a shocking lack of oversight which is not compatible with a satisfactory fire regulation enforcement regime. It is no longer necessary to have a local authority inspector check for compliance. At Grenfell Tower a large chain of companies was involved in the refurbishment which led to the use of the cladding. In a situation where government cuts have contributed to the increasing growth of outsourcing, sufficient regulation and oversight should be in place in order to ensure that these private suppliers maintain the highest safety standards. However, it is no longer necessary to have a local authority inspector check for compliance. Companies are able to hire their own inspector to check that the construction meets the required standards. Under this system, in 2015 the Cabinet Office boasted that some businesses had had their fire safety inspections reduced from 6 hours to 45 minutes. Serious attempts to regulate for safety often only seem to follow a disaster. In the absence of a central regulatory body, sector bodies such as the Building Control Alliance and the National House Builders’ Council have provided advice outlining how to avoid meeting the standards established in the regulations. Clearly the attitude that regulations are an unnecessary hindrance to business is endemic and has spread from the top. Serious attempts to regulate for safety often only seem to follow a disaster. Changes were made following the Kings Cross Fire, the sinking of the MS Herald of Free Enterprise and the Paddington Rail disaster. The events that led to these disasters were foreseeable, and you have to wonder if deaths could have been prevented if proper attempts to regulate for safety had been made prior to these disasters occurring. Arguably, in the aftermath of the disaster at Grenfell Tower, the human cost of austerity cuts and the 'cutting of red tape' is laid bare for all to see. We need a transformation in attitude that rejects David Cameron’s call for his government to “kill off health and safety culture for good”. Laurence Waterman OBE, head of Health and Safety for the London Olympics observed that “we talk of red tape but never white or gold tape, or that good Health and Safety is good business”. This must change. Without adequate regulation, along with the funding and the political will to ensure compliance, people are left exposed to unregulated and potentially dangerous products, unsure whether their homes or the items within them are safe. Failure to adequately operate a regulatory system has been shown to have damaging consequences and we should not allow an aversion to placing obligations on business trump real and justified concerns about public safety. We need to ensure that the regulations necessary to protect us all are created and enforced, not just to prevent another disaster like Grenfell Tower, but to ensure such disasters never happen in the first place.